There’s an old maxim about the three most important factors that rule real estate: location, location, and location. In my studies of global companies that have installed a one-language policy, I’ve found a similar truth about the three most important factors to learning English: attitude, attitude, and attitude. No one can argue that learning a new language isn’t difficult. It requires many hours of study, deliberate practice, memorization, and conversation with others, as well as a willingness to make mistakes and occasionally appear stupid. Learning a new language, at any age, is proven to be good for your brain. Bilingual children reap life-long cognitive and social benefits. Older adults who learn a new language are said to increase neurological pathways. And for global workers in the business world, having at least a useful level of English is key to success. In my five-year study of employees at Rakuten, who were located across eight country sites, I found that people often held one of three attitudes to learning English. The majority of Japanese employees, upon being told that they had to reach a reasonable level of proficiency within two years or risk demotion, were filled with fear. Fear that they would fail. Fear that they would lose their job. Fear that they would appear incompetent or unproductive in front of their colleagues. The problem is that fear makes it difficult to learn and focus on the task at hand. Fear was accompanied with other feelings, such as shock at what seemed an enormous challenge and loss at the idea of being unable to speak in their comfortable mother tongue. In some cases, the fear of learning English made non-native speakers absent at meetings or avoid contributing valuable ideas. Although the linguistic expats as I called them, because they became language expats in their own countries, eventually did overcome their fears, and the vast majority passed their English-language proficiency test, fear made the process more difficult. The Rakuten employees are not the only people I have seen stymied by fear in speaking English. I have met non-native English speaking executives who have communicated and led meetings in English for 20 years who confess to feeling uncomfortable, especially around native speakers. In other cases, executives who feel reasonably confident using English in a business context become fearful about what to say in social situations. Those who understood the English language mandate at Rakuten as an opportunity found it much easier to do the hard work required to learn a new language. Motivated to learn English as a way to boost their careers, they were well aware that listing “proficient in English” on one’s resume is a gold star, a way to stand out from the crowd. Although the non-native English speakers I interviewed in countries such as Brazil or Indonesia felt nervous about having to conduct business in English, their nervousness was combined with openness toward a new and challenging experience. Like the Japanese workers, they too belonged to the linguistic expat group. However, their enthusiastic attitude to pursue what they viewed as an opportunity made learning a new language less painful. It also led to concrete, productive actions; for example, spontaneously organized study groups in which co-workers could learn together and from one another. Attitude 3: Saying Why Not? A sizable number of Rakuten workers had already been required to use English at a previous job for another company. Many of the people I interviewed who fit this profile lived in Europe, where multilingualism has long been an accepted norm. Even those who had not been required to speak English at another organization were relieved rather than surprised at the news of Rakuten’s English-language mandate. “It’s about time,” said an engineer in Germany. “What took Rakuten so long?” said a marketing manager in France. Because this group, which I call dual expats, was already comfortable with the idea of English as the lingua franca, and in many cases already had some experience with using English, their path to proficiency was the least difficult. They saw no reason not to learn English and many benefits. If you and your colleagues can view the task of language learning as an opportunity or an inevitability that will obviously make the job easier than if your primary emotion is fear. The majority will feel some combination of attitudes towards learning English as well as a range of attitudes over time. The important thing to keep in mind is that learning a new language is dependent on attitude in addition to aptitude. 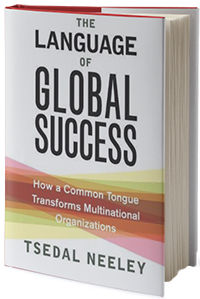 To learn more about adopting a new language and how a language strategy can drastically change the development of a global business, read The Language of Global Success, available now at your favorite book retailer.